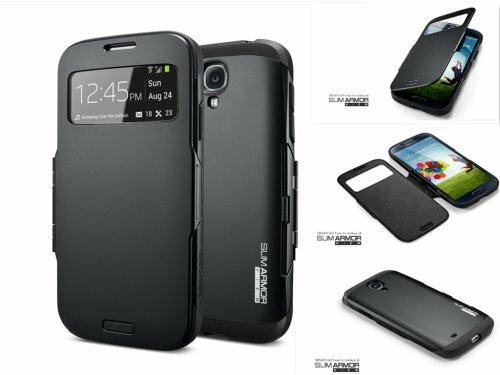 The SPIGEN SGP Slim Armor case for the Galaxy S4 gets fused with the Samsung S-View type cover in a new and innovative flip case that is designed specifically to increase the user experience for Galaxy S4 owners. Slim Armor View is a full body cover which protects the front, back and sides. The Slim Armor View takes our popular dual layered case and includes a flip cover made of polycarbonate for protection against scratches and accidental drops. The flip is attached to the Slim Armor through a special hinge that can be folded all the way back without resistance. Slim Armor View includes the automatic sleep / wake function when you close cover. It also includes a window like the S-View Cover to allow users to see all notifications and incoming calls. Phone calls can also be answered quickly by clicking the home button directly from the front cover of the Slim Armor View.